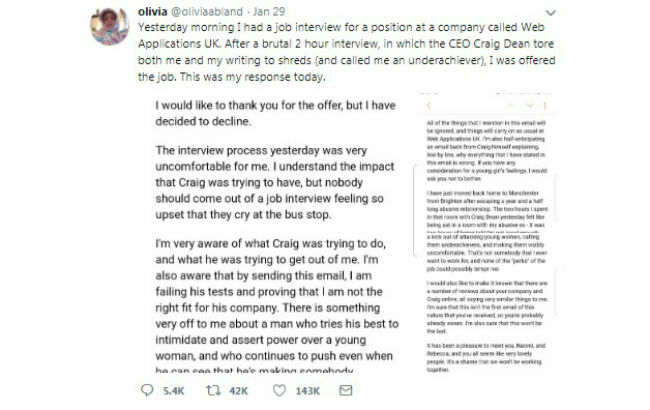 Twenty-two-year-old graduate Olivia Bland applied for a job at Web Applications UK but underwent a challenging second interview with the CEO, according to MSN. The “brutal” episode lasted two hours and Craig Dean “tore both me and my writing to shreds (and called me an underachiever),” she said. She said the CEO tore her down to build her back up again, by telling her she wasn’t good enough and detailing exactly why, while quizzing the candidate about her childhood and parents.